Gastric Dilation Volvulus (GDV) is a life threatening, acute condition that requires immediate medical attention. 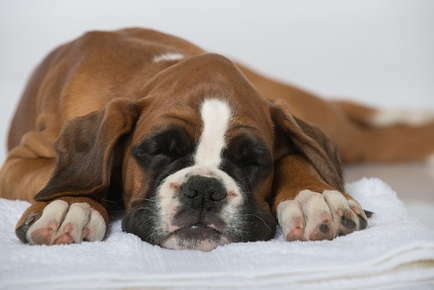 Certain breeds are more prone to this condition: boxers, great Danes, standard poodles, saint bernards, Irish setters, dobermans, weimaraners and gordon setters. These breeds are considered deep-chested (large chest and narrow waist) but any similarly shaped dog can be at risk. Diagnosis of GDV is made based on physical examination, history and abdominal x-rays. Often GDV happens when a pet eats a large meal and then becomes very active. Initially the dog may become restless, try to vomit or retch continuously but is unable to produce any vomit. This is because the stomach has twisted, preventing anything entering and exiting the digestive system. The pressure inside the stomach starts to increase and the dog may salivate and pant excessively. As the patient's condition progresses they become lethargic, have a swollen stomach and eventually collapse. If not treated, the internal organs can be damaged and without timely treatment this condition is fatal. The goals of treatment are to reduce the pressure in the stomach and return the stomach to its normal position. During the surgery, the stomach and internal organs are examined for damage and then the stomach is attached to the body wall to prevent a reoccurrence. Prophylactic suturing of the stomach is sometimes advised in breeds predisposed to GDV during abdominal surgeries for other causes. Other preventative measures include restriction of exercise before and after feeding. Feed twice a day instead of once a day and not to elevate food/water bowls. "We have a 5 star rating from 99.1% of our clients! We've been bringing our pets to Janssen Clinic since 1998. Dr. Janssen and his team are the best. I never struggle trying to get in for an appointment & they are so kind and good with my pets. Dr. Janssen is very calm & caring. My dog is high strung & extremely attached to me. She calms down quickly in their office, however, because of their ability to soothe her. We wouldn't go anywhere else."